To reach this unique place in the world, also known as the Marvel of the Western World, the sea has to draw aside to let anyone go through. The Mont Saint Michel is at the same time a village, an island and an abbey erected on the top of the rock at almost 100 meters high (300 feet). Since the dream of the bishop Aubert in 708 to the current abbey generations of workers, pilgrims, monks, sellers, soldiers, kings… were irreparably attracted by this site whose construction was constant from the 10th century to the 17th century. 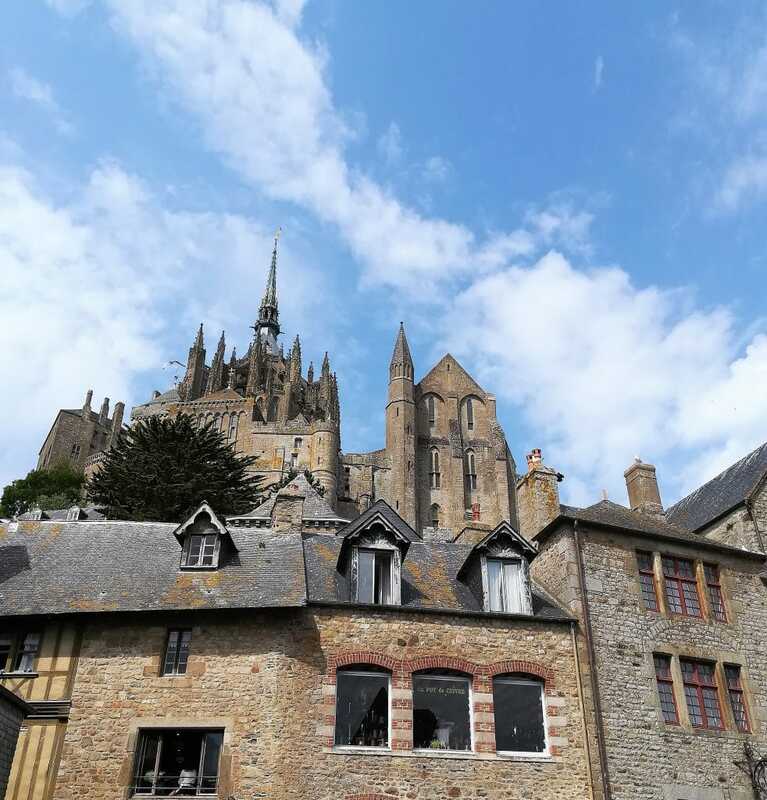 The Mont Saint Michel is located in a bay which is, like the village and the abbey, in the World Heritage List of the UNESCO and where the tides are the largest in Europe, they can be 15 meters high (45 feet). During your visit you will understand how people could start a building site 1000 years ago on the top of a rocky island, surrounded by water with impressive tides. Your private guide will explain you why the worship of Saint Michael was started here and how a part of the story was made up and by who.It is a unique journey in a very special place. You will of course have time to enjoy a stroll in the village. Then you will head to Bayeux to enjoy another work of the World Heritage List of the UNESCO. It is the only “large” town that was not damaged during World War 2 and thank to that fact you will enjoy several aspects of this old settlement. 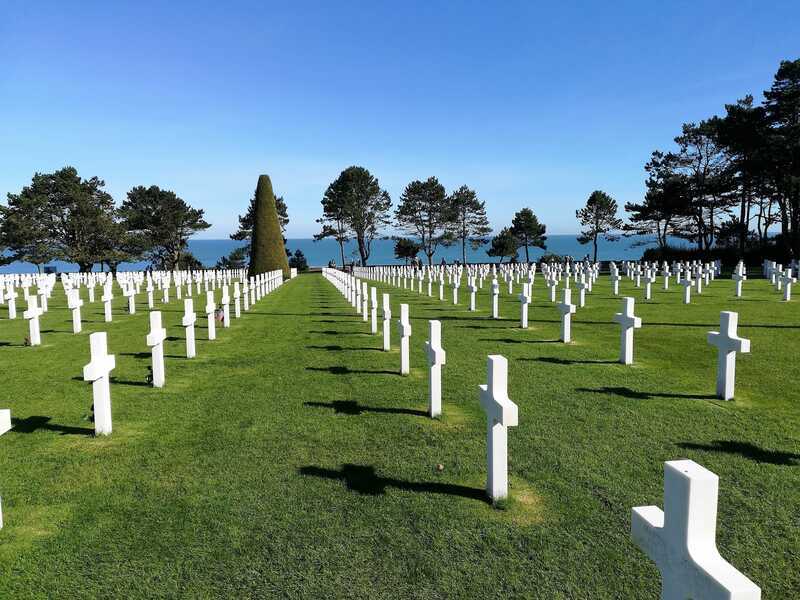 World War 2 is still very present with the main British Military Cemetery where more than 4000 British soldiers are burried. Bayeux is especially connected to the Duke of Normandy,William The Conqueror because it is in this ancient village by the river Aure that his brother Odo, bishop, commissioned the construction of the cathedral Notre Dame and the “Tale of the Conquest” more known as Bayeux Tapestry that depicts the battle of Hastings in 1066 on the shores of England and its main consequence : the coronation of William The Conqueror as king of England. This unique and old piece of embroidery is 73 meters long (225 feet) was exhibited for the first time in 1077 in the cathedral. You will enjoy and understand with your private guide why this almost 1000 year old piece of work was such precious asset for the Dukes of Normandy. It is impossible to cover the whole coast line one day (that’s why we recommend at least 2 days), however in one day your private guide will take you to 3 or 4 sites such as Pegasus Bridge, one the first site captured during the battle of Normandy by the 6th British Airborne Division in gliders, definitely one of the sharpest action, then the Canadian sector is nearby especially Juno Beach and its museum opened in 2003, from Juno we will reach Gold beach in the British sector where you will see what remains from Mulberry B, the port that was made in front of the little town of Arromanches Les Bains. During this visit you will indeed realize that logistics was one of the most impressive and conclusive aspects of the war.